Mercedes had time to clean a car while double stacking, Ferrari’s sacrifice wasn’t for the greater good and Shanghai failed to deliver in F1’s 1000th event. 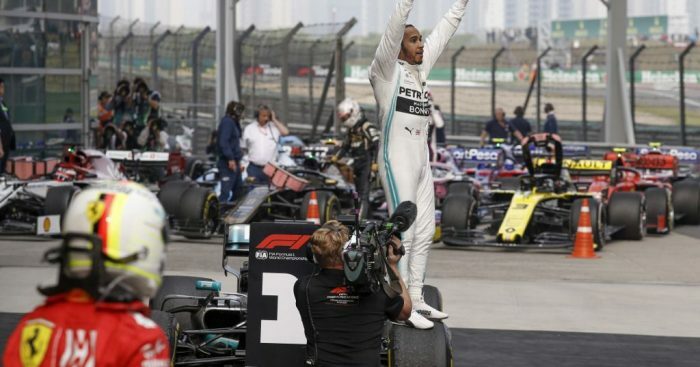 Lewis Hamilton has many fine qualities as a driver and many of them were on display in Shanghai, bar overtaking, such was his and Mercedes’ dominance on race day. This despite the defending champion seeming to be uncomfortable with the fast but temperamental W10. Although team-mate Valtteri Bottas hooked up a better qualifying lap, it was Hamilton who aced the start of the grand prix to take the lead into Turn 1. From there Hamilton controlled the race, as he now controls the Championship, showing a Michael Schumacher-esque situational awareness to ask his team what Charles Leclerc was going way down in fifth position. Bottas had no answer to Hamilton’s prowess off the start line and race management. Mercedes have now claimed 1-2 finishes in the first three grands prix of 2019, and while they were fortunate in Bahrain, it is clear that Mercedes has the best car in the paddock. It may not be as fast as Ferrari on a rear-limited track such as Bahrain, but at the front-limited Chinese Grand Prix and on the bumpy streets of Melbourne the W10 was unstoppable. The double stacking at the second round of stops underscored Mercedes excellence. Not only could they service both Hamilton and Bottas for new rubber, they even had time to clean the latter’s front wing. It was a mixed weekend for the men from Red Bull’s stable. Pierre Gasly finished sixth, just one place behind team-mate Verstappen. This looks good on paper but a closer inspection of the timesheets shows that the Frenchman was around a minute behind Verstappen. That said, his late blast on soft rubber to claim an extra point for the fastest lap will do no harm in helping Gasly to build some confidence. Another man brimming with confidence after the visit to Shanghai will be Alex Albon. His crash in FP3 meant he missed qualifying and had to start from the pits. But an astonishingly mature drive on an offset strategy, which included magnificent defense against Romain Grosjean late on, was enough for Albon to claim the last point. For team-mate Daniil Kvyat there is never a dull moment, as he torpedoed both McLarens on lap 1 to pick up what may have been a harsh drive-through penalty. With Gasly under pressure, it would seem Albon is now in pole position for a potential promotion to Red Bull but, for Toro Rosso, China represents a missed opportunity as the STR14 was quick around Shanghai and more points were available. After the race Sebastian Vettel said of Mercedes: “they were just too quick for us.” Ferrari’s lack of pace relative to the Silver Arrows was compounded by the Scuderia’s decision-making, which put them under pressure and allowed Max Verstappen to split them. Leclerc was asked to move aside for Vettel, obliged, but then complained that the German was not in fact quicker than he was. The net result is that Ferrari sacrificed Leclerc, meaning he finished fifth rather than third. This sets a dangerous precedent for the rest of the season and given Leclerc’s speed, rest assured we will see this issue arise again. Toto Wolff has defended Ferrari's use of team orders at the Chinese Grand Prix. Has Vettel buried the ghosts of 2017 and 2018? F1 next visits Baku, the venue for Vettel’s “bumper cars” moment of madness against Hamilton in 2017. Since then Vettel’s glittering career has lost some of its sheen due to numerous spins and a series of incidents involving contact with rivals. Vettel, though, went head to head against Verstappen in China and successfully positioned his car to defend P3 while also avoiding contact. It may seem like a small moment but could this mark the return of Vettel 1.0? A first podium of the season suggests Vettel is heading in the right direction, though it is hard to see how the four-time Champion can beat the Mercs on a consistent basis — not to mention his team-mate. Renault only got one car to the finish, though Daniel Ricciardo won the ‘class B’ battle with P7. Sergio Perez showed his trademark tyre management skills to caress his Racing Point to P8 and Kimi Raikkonen drove a fine race to claim ninth for Alfa Romeo, the manufacturer that won the first ever F1 race. Event 1000 was largely processional with highlights few and far between, unlike Bahrain where it was too easy for cars to overtake using DRS. Perhaps Baku will deliver something in between?